So, Ed and I have a new gig. Writing for a magazine! 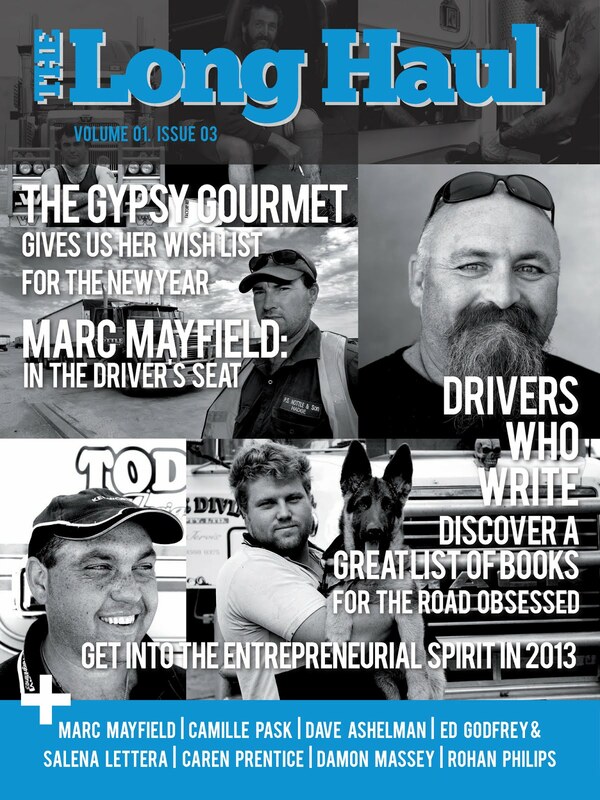 The Long Haul Magazine is a brand new, interactive, bi-monthly digital lifestyle magazine currently available to anyone with an iPad. The photo below, from the third issue of the magazine, is the one in which our first column appears. See our names down there on the cover?! We were first approached by the Editor by email, then had a meeting with her via Skype(which was pretty cool) to talk about the ideas she had for our contribution. She thought we could write a coaching column in the magazine, a way for us to share how we "do life" on the road with other drivers. Kinda like I do here on the blog...only with a little more on the subject of trucking and a little less on the subject of the latest antics of my mother. Every driver out here knows this industry is a way of life. It is a lifestyle. 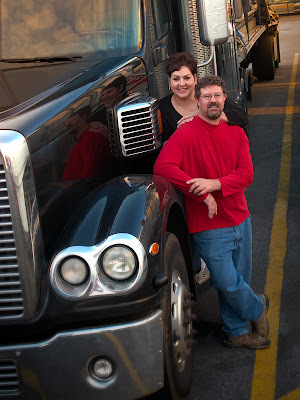 And Ed and I have a particular type of trucking lifestyle we've found many drivers would like to emulate. The majority of the emails I get consist of "How can I do what you guys do?" People like the truck, the travel, the idea of making money. They want to know how we've gotten to the point we're at today. They ask questions and I answer. I share every little thing I can. I'm an open book. And that's what we'll be doing more of in the column. Ed and I, together. All of the important stuff is inside Ed's head. It's my job to release it. The page below is another screen shot - the first page of our current article - and is the header that will appear in all of our columns, the truck and us. The background photo of the truck is one that I took at Sahuaro National Monument West in Tucson, Arizona. The picture of Ed and I was taken by our friend Marlaina's husband, MacGyver, at a truckstop in Pennsylvania on one of the lucky days our paths crossed. We had dinner together and staged a photo shoot. I love the photo. So if you have an iPad, and you're interested in the newest digital magazine in the industry, go to iTunes and download a copy for yourself. It's different from anything that's out there. And it's the only place you'll be able to get more of me and Ed. Well, until our book comes out. I'll keep you posted on that too! What about us fans who don't yet own an iPad? Any way to download to a Mac or PC? Congratulations, and look forward to reading what you have to say. That's awesome and a very smart decision on someone's part to get you and Ed involved. Between the two of you, you will be able to help out a lot of drivers and wannabe drivers. The industry needs more people like you and Ed! Congratulations! Oh, how cool is this! No ipad so DO NOT forget about this little humble GREAT blog please. Thanks folks. The fact is that most people will fail at this career due simply to an inability to be able to drive 150K miles a year after year after year. They will not be able to handle being away from their family and friends for weeks at a time. They will not make the money that they feel they deserve and will quit within the first year. The information we have is for the very few people who make it past their first year AND want to become owners who juggle everything that goes with that. 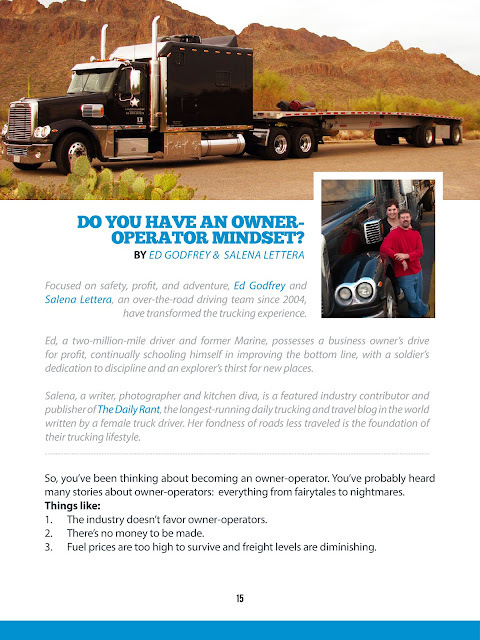 As I know over my career, MOST people just don't have what it takes to last in trucking longer than a year. It's not their fault and most of the time the industry's self destructive posture is to blame for the high turnover rate. Otherwise we will try to dole out some useful information that hopefully will keep the people who want to make it in trucking in the black. We don't know everything and we aren't perfect, but we get constant questions about operating in today's environment so we are happy to help out where we can. Salena this is really me this time LOL Thank you for all that you and Ed gave to Chuck tonight. God Bless you both. I love your blog and it's fun to look through all your backlogs of posts. BELLEDOG: I'm hoping they'll roll out a version of the magazine for people who don't have iPads since not everyone has a tablet yet. JULIE: Thanks for the congrats. I think we'll be able to offer some good advice. At the very least, our experience and how we do what we do. DEE: I will never forget about my blog - it's my first priority. Always. I don't think I know how to be anything but an open book - it's my nature. And I do feel it's necessary to share what you know. People use information in all sorts of ways and if anything we offer can make someone better - especially within our own industry - it makes the whole industry better, so I'm all for it. ED: Thanks for your input, baby! JEAN: Glad you were able to comment - look forward to reading more of them. You're so welcome for tonight, we really enjoyed meeting both of you and look forward to hearing about Chuck's progress. Take good care of yourself. We'll see you soon! Congratulations!!! This is way cool; downloaded my copy today and emailed the link to Karl. I am often sad that I was one of those that didn't make it more than a year and a half. Now Karl's health hangs in the balance, also. I know I could have made it if we had not been forced to drive so hard day after day. Some of that was the choice I made to take the dedicated route to be home more regularly. In the end, I could not trade my health for the money. I really admire your saavy, Ed, to provide a good living for you and Salena in a difficult industry by driving smarter. And Salena, you already know this, but you just ROCK. GIL: Thanks! I think there might be an app for a PC to read eBooks - I'm pretty sure Amazon has the Kindle for PC program. I use the Kindle app on my iPad and can read ebooks that way. This particular application though, is for the iPad. Not sure that it would work on an ereader. ANONYMOUS: I've sent your comment on to the editor of the magazine. It's a little tricky getting the magazine to work after you download the app and I can't remember how I did it. I'll return here to comment as soon as I find out. This is an iTunes issue, they will not charge the subscriber until the thirty days is up. Free issues are for subscribers only. If they do not want to pay the 1.99 then they just need to unsubscribe before the thirty days is up. They will need to go into settings on their iPad to do this.